This is what I wear on a normal day. Its comfy, and practical, and I feel awesome. My version. Don't worry, it doesn't make you look pregnant. I am pregnant. Almost 20 weeks. 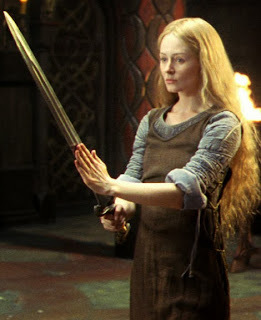 It's loosely inspired by Eowyn's Jumper ensembles ("Refugee Outfit"). I really like Jumper outfits with shirts rolled up to the elbow. It just looks so....awesome. Like your life is full of action and adventure. Of imminent battle and defense, or chasing small children and keeping them alive. Mine is based on the "Gothic Fitted Dress/Cotehardie/14th century women's dress", made by 4 panel construction, self lined from the shoulder to the hip. Laces up the front (yayy nursing! ), and is *very* supportive which is very nice. (Here is a picture of one, Here are instructions to making your own) It is a very economical way of cutting, with gores inserted which makes for almost no waste. This dress was made from 4 yards of 33" wide fabric, which translates to about 2-2.5 yards of 60". There was literally a handful of scraps left. Authentic ones have sleeves, and are made out of wool, linen, or silk. Mine is made from cotton twill (medium weight) canvas I got for $1/yard on clearance at Jomar in Philly. I dyed it myself with RIT dark brown dye and salt (in a bucket, alas, hence the blotchiness). The lacing cord is a 4 strand braid of the cheapest yarn at walmart. The eyelets were poked through the fabric with an awl (or a chopstick) and hand-sewn with DMC floss from walmart. I stiffened the hem with a braid of scratchy twine from Lowes. (alot cheaper than horse-hair braid...). All in all, I think the dress cost around $7. The circlet is gauge 20 steel wire from lowes (110 ft for 5 bucks), around my head twice, wrapped in cotton thread. Worn like this. [insert link] I think it looks good with a braid. I wear this outfit surprisingly a lot. I love how supportive it is, it lifts the bustline giving the illusion of a waist to this 20 week pregnant woman. And the gores mean it fits at 20 weeks although it was made from an unpregnant me. And the front lacing means I can nurse in it. Somehow, in self timer pictures I always manage to look deranged. Josh took all the other pictures, which explains why they're so much better. I love your jumper! What did you use for the undershirt/dress?